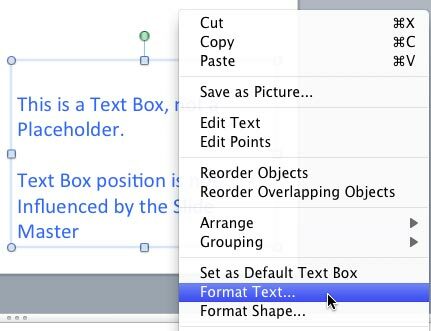 As far as formatting text containers is concerned, we would like to suggest you to do the formatting for only the text boxes (and shapes) rather than individual text placeholders on the slide. Yes, you can do these changes for the placeholders but that's going to make your text look inconsistent across successive slides -- so, if at all you want to change the text layout for text placeholders, do it within the Slide Master to provide a consistent look to your presentation and also to save your time. Open your presentation and navigate to the slide that includes a text container -- if you don't have one, you can insert a text box, and add some text. Click on the edge of the text box so that it shows a solid line with selection handles on its perimeter. Then right-click on the edge of the selected text box to bring up the context menu you see in Figure 1 -- select the Format Text option. This brings up the Format Text dialog box as shown in Figure 2. Make sure to select the Text Box option within the sidebar (highlighted in blue within Figure 2). Alignment: While Figure 2 reads this option as Vertical alignment, this does not read as "Vertical" all the time. Many times you will find this option reads as Horizontal alignment -- and whether you see Vertical or Horizontal alignment, this option is related to the Text direction option you choose -- we look at the Text direction next. Text direction: Enables you to rotate the text within the text container. Click the Text direction selection box to bring up the options as shown in Figure 3. In Figure 4, you can see a sample slide showing text applied with all of the four Text direction options - look how the text direction influences the rotation plane of the text within the text boxes. Horizontal: This is the default Text direction option that provides you with conventional text on a straight plane as we are normally accustomed to. 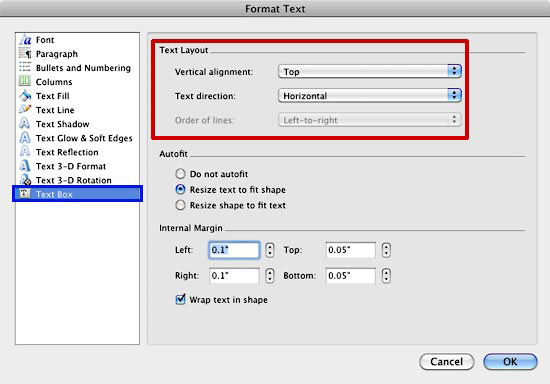 When you select Horizontal text direction, your alignment is set as Vertical (refer to Figure 2, above). Click this selection box to bring up the options shown in Figure 5. Here you can choose to align your text to Top, Middle, or Bottom. You can also choose centered versions of these three -- known here as Top Centered, Middle Centered, or Bottom Centered. Whichever option you choose, expect the alignment of text within the selected text container to change -- Figure 6 shows example of how the vertical alignment of text is influenced by applying these six variations. Rotate to 90o Counterclockwise: Choosing this option within the Text direction selection box (refer to Figure 3, above) rotates your text within the text container to the extent of 90 degrees counterclockwise, i.e. 270 degrees as shown in the second example on the top row of Figure 4, above. The minute you select Rotate to 90o Counterclockwise, the alignment option will change to Horizontal alignment as shown in Figure 7). Clicking the Horizontal alignment selection box will bring forth options to align your rotated text along the same lines as Horizontal (non-rotated) text -- but results differ due to the direction of your text. Figure 8 shows examples of how horizontal alignment of rotated text works. Rotate 90o Clockwise: This option rotates your text within the text container to the extent of 90 degrees, as shown in the third example on the top row of Figure 4, above -- different from rotating the text in a completely opposite direction. Predictably, the alignments are still Horizontal (as shown in Figure 7). Note the subtle differences in the location of the text shown in the sample slide shown in Figure 9 (compare Figures 8 and 9). Stacked: This last option within the Text direction drop-down list (refer to Figure 3 above) stacks the text in vertical lines. You can see the examples of how the alignment of text within the text box is influenced by applying these six alignment variations, in Figure 10. Note that after changing the text direction to Stacked, you might need to resize the text containers since these text containers need a larger area to show all the text. But, it also depends upon the Text Autofit options you have set. Order of lines: This option (highlighted in red within Figure 11), which is usually grayed out -- is only available when the text direction is changed to Stacked within the Format Text dialog box, as shown in Figure 11. Click the Order of lines selection box to bring up a drop-down list, as shown in Figure 12 -- choose between either Right-to-left or Left-to-right options as shown in Figure 12. For normal English text that is read from left to right, you will want to use the default Left-to-right option. Click the OK button within the Format Text dialog to apply the changes and get back to the slide. Save your presentation often.